The gap between your typical monthly spending and your average monthly spending is what gets many people into financial trouble. 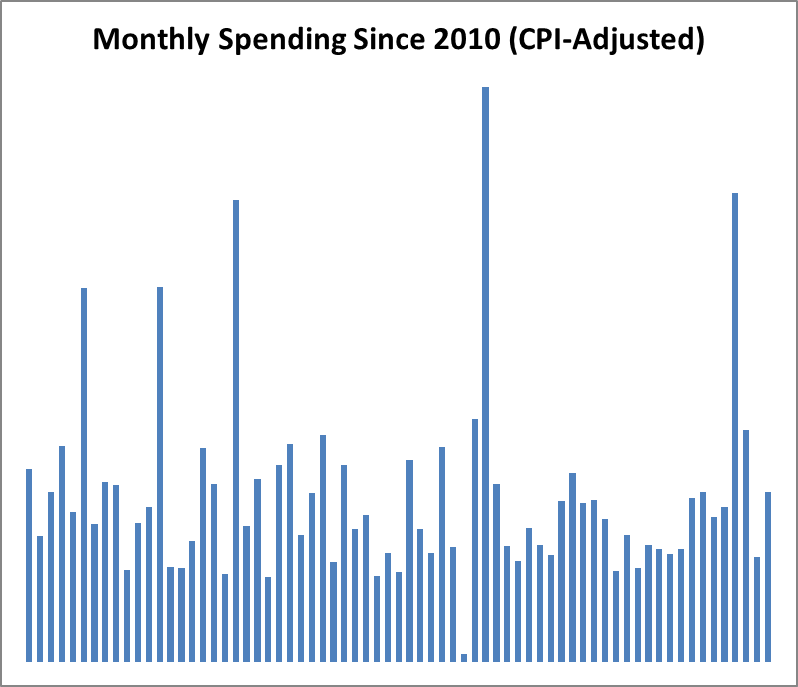 I collected my family’s monthly spending since 2010 to illustrate how it’s human nature to get into financial trouble if you’re not wary. 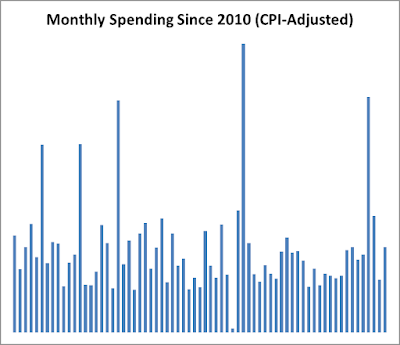 The main thing to see with this chart is the amount of variation from month to month. My family’s spending variation may be greater than most, but everybody’s spending varies somewhat. Some people are dedicated to using equal billing plans and paying for cars and other large items with loans. Even these people have unexpected big expenses from time to time. The next chart shows the average and median spending amounts for my family. “Average” here means adding up all the amounts and dividing by the number of months. “Median” means the amount where half the months are above and half are below. 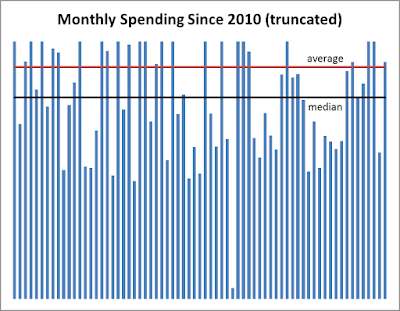 I’ve expanded the chart and cut off the big months to better see the average and median. The main thing to see with this chart is how much higher the average is than the median. 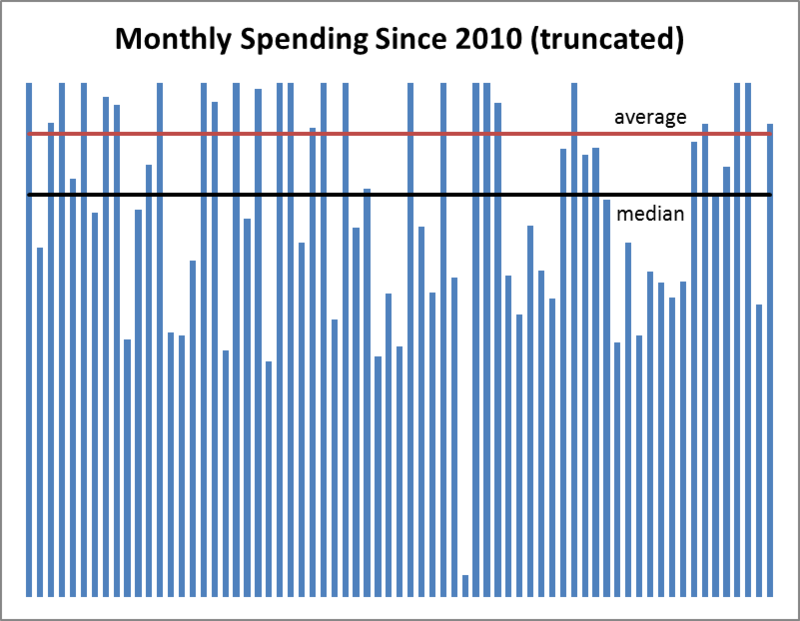 This happens because there are many months with a little below average spending, but a few months with much higher than average spending. Over a long period of time, you need to earn enough money to cover your average expenses. But over short periods of time, an income that covers your typical month’s expenses can seem to work. This means that inattentive spenders who let their lifestyles rise to cover their incomes will float along okay for a while, but will get hit hard by big infrequent expenses. In some ways, those who try to smooth out their monthly costs as much as possible with equal billing plans and car loans or leases are even more vulnerable. These people can go several months with almost exactly the same monthly expenses before they’re hit with a big unexpected cost. The remedy for this problem is to have some sort of savings buffer or emergency fund. Just having an emergency fund isn’t enough, though. You also have to carve out a periodic amount from your income to fill the emergency fund back up after you’ve had to dip in. Some people prefer to have access to a line of credit instead of having emergency savings. But this only works if you have enough slack in your budget to cover the line of credit payments. And if you have this slack available, why not build up some emergency savings now instead of going into debt later? The truth is that too many people who rely on lines of credit for emergencies end up just continually building their debts. When I think about how much money my family needs monthly, I look at our actual spending, but that’s just a start. Then I look at big, infrequent items, like a new roof, a new car, etc. Then I take those items out of our actual spending, and add back an average figure. So, for example, if I’ve looked at our spending for one year, and we installed new flooring that year, then the results are skewed because we won’t be fixing the flooring again next year. So, I take the floor costs out of the spending and add back in an average monthly figure. So, if I expect to spend $15,000 every 25 years, that’s $600 per year, or $50 per month. Then I add in monthly costs for all the other infrequent items I’ve identified. The final result is my family’s estimated monthly cash needs. If you go through this same exercise, it will give you an idea of how your income compares to your true long-term average spending. The scary scenario is where your estimated average spending exceeds your income. Too many people are in this situation and don’t know it. re: "You also have to carve out a periodic amount from your income to fill the emergency fund back up after you’ve had to dip in." But isn't that just a continuation of what had to be done initially to create the emergency fund in the first place? I would think as expenses/prices continue to rise, so would the growth/contributions of the fund, e.g. match inflation. Might also be investing/valuable to track the periodic occurrences of "emergencies". I think true blue emergencies would occur far less than say general maintenance which should be planned. Perhaps many emergencies are covered by insurance thus requiring a fraction of personal pay-outs? @SST: Some people advocate having two funds. One is for unpredictable expenses such as being asked to travel to a destination wedding. The other is a true emergency fund for non-optional things like job loss or medical costs. No matter how well you plan, though, things are going to come up that you didn't expect. Having savings to dip into (and then replenish) is a smart way to handle your finances. For many, making the cut between emergency and unexpected is as difficult as knowing what are needs or wants. I often ear about unexpected 400$ car repair (on a 12 years old beater) or unexpected dentist bills (having 3 kids 6-14 years old). If this kind of bad planning hurts, what if a real emergency happens? @Le Barbu: For too many people, the definition of financial "emergency" has less to do with predictability or genuine need and more to do with whether the person has the money to pay for the "emergency". A $400 car repair is no big deal if they have the money but becomes an emergency if they don't have the money. "Some people advocate having two funds." I might advocate making the emergency fund a percentage/part of your entire portfolio. Thus when/if you dip into it, instead of having to increase your savings rate, you merely rebalance your total portfolio (e.g. sell a share of BRK). @SST: Of course, selling investments is always an option, but I don't think that is a good replacement for emergency savings. The main reason is that losing your job and having your investments crash are highly correlated.